His life was cut short at its prime, but the legendary Little Dragon left much more than just a few hundred meters of celluloid. 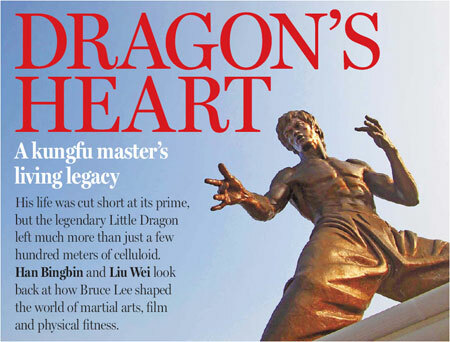 Han Bingbin and Liu Wei look back at how Bruce Lee shaped the world of martial arts, film and physical fitness. 'Some day, the entire world will want my autograph." This was a line from Bruce Lee My Brother, a biographic film released late last month to mark what would have been his 70th birthday. Whether Bruce Lee actually said these words is moot, but we all know the truth of the sentiments. The question is, would he have been equally influential in film and martial arts if he had lived? As it is, the legend of this Chinese-American actor lives on untarnished by age. To his legions of fans, the image of Bruce Lee is frozen at his peak - nunchaku in hand bashing the bad guys to a pulp, or executing a gravity-defying kick in his black cloth shoes. He was portrayed as a country boy out to vindicate ill treatment by big city bullies and arrogant foreigners who compared Chinese to dogs. But the truth is, Bruce Lee never set foot in China and the closest he had been was Hong Kong when it was still a hybrid of East and West as a British colony. The only thing both Americans and Chinese agree on is how his popularity has gone viral after his death - as an action star and a reformer who changed the face of Chinese martial arts. In 1999, Time magazine named him one of the 100 most influential people of the 20th century, and in 2005, Variety crowned him one of the "Icons of the Century". Further proof comes from the Internet. George Wang, assistant professor at the University of Hawaii's academy for creative art did an experiment. He Googled Bruce Lee's name together with John Wayne, Elvis Presley and Marilyn Monroe. Lee came third in the Web search and second in the image search. But on video, he came tops, thanks to the more than half-million video clips available on YouTube. "Bruce Lee is a real superstar," says Wang, who had made kungfu films his particular area of interest. "His accidental death, unfortunately, was the ultimate factor that placed him on the altar of everlasting international stardom." And while Lee is a pop-culture icon in the US, his influence among the Chinese, especially in China, has become a lot more significant than he ever dreamed. Lee is a hero, and his spirit still inspires generations of martial arts practitioners today. In film, he changed how a Western audience looked at Chinese movies, paving the way for later stars like Jackie Chan, Jet Li and Donnie Yen to bridge the great divide between Hong Kong and Hollywood. He single-handedly shifted the direction of action films, inspiring producers, directors and actors in Hong Kong to take a closer look at their own culture. After his death in 1973, there was a wave of copycat productions, which latched on to his phenomenal popularity and featured a crop of Bruce Lee look-alikes in countless Bruce Lee-inspired movies. None of them succeeded. All lacked the magic combination of fury, pride and the country-boy-against-big-city-bullies formula that made his films such winners. But Hong Kong soon started looking at the real legacy Bruce Lee left behind. Veteran critic and author Tan Fei sums it up nicely. "What Bruce Lee brought to the film industry was tremendous," he says. "He established the genre of action film. He made Asian films known to the world." And in so doing, Bruce Lee indirectly affected some of Hollywood's future directors as well. Quentin Tarantino was a fan, Tan says, and he paid tribute to Bruce Lee by putting Uma Thurman in his signature yellow and black tracksuit in Kill Bill. But the Bruce Lee phenomenon reached far beyond Tinseltown. Another Bruce Lee fan was Chairman Mao Zedong, who watched three of his films repeatedly after Liu Qingtang, then vice-president of the Ministry of Culture in 1974, found copies. According to Liu's memoirs published in Yangcheng Evening News, Mao would clap while watching the films and exclaim: "Good kungfu, good hit!" In the 1970s, China was closed and marginalized on the global stage. Overseas Chinese were shamed by the parochial image and Lee and his invincible roles provided an outlet for their ethnic pride, according to Zhang Yiwu, culture critic and a professor at the Peking University. Zhu Dake, professor at the institute of cultural criticism at Tongji University in Shanghai, agrees. At that time, Lee's strength on screen was a shot in the arm in the doldrums of economic inferiority. "The fact that Lee was an overseas Chinese could not have stopped the massive hero-worship. To the contrary, it actually intensified the adulation because being an overseas Chinese meant you were on the frontline in combating 'foreigners'," Zhu says. But, Zhu notes that Lee was never a symbol of nationalism. What he expressed through his films and his Jeet Kune Do practice were universal values of dignity, freedom, equality and justice. To columnist and film critic Xiao Fei, Lee was more than just brawn. He had brains as well, and his profound influence is a result of not just his charisma on screen but also because he was a thinker. "He was first and foremost a wise man with a free will, before he was a martial artist," says Xiao. Under the tutelage of Ip Man, his master in Hong Kong, Bruce Lee understood that martial arts was about control of the mind. His understanding was enhanced by his study of eastern and western philosophy in his college years in the US. In his 20s, Bruce Lee was already questioning, and eager to break the barriers between the different schools of martial arts. "Lee described Jeet Kune Do as a 'style with no style', or in his words, 'formless and shapeless like water'. Water can take any shape, depending on the vessel that contains it. Lee believed martial arts should be as fluid as water. "For Lee, it was a system of learning and thinking, pursuing freedom of heart and wisdom and eschewing the obsession with dazzling moves. We may not have his talent, but we can own the independence of soul and freedom of thinking as he advocates," Xiao says. Sometimes, the creation takes on a life of its own. There is now a new style of calligraphy called "Jeet Kune Do" created by a calligrapher in Xinjiang. And a new marketing theory follows the principles of Jeet Kune Do, just as Sun zi's Art of War has been adopted as a marketing bible. We won't even tell you about the restaurant and the line of electronic goods from Japan. February 28th (January 15th in the lunar calendar) is the Lantern Festival, one of the great Chinese traditional festivals.So far, the stamps with the theme of festival lanterns have been issued in the Chinese Mainland, Hong Kong, Macao, and Taiwan. The game of cuju was first mentioned in the Zhan Guo Ce (under State of Qi's section) and later in the Sima Qian's Shiji (under Su Qin's biography), written during the Han Dynasty. In China, alcohol is also called the "Water of History" because stories of liquor can traced back to almost every period in Chinese history. The Chinese herbal tea or cold tea is a drink concocted from medicinal herbals to ease the summer heat in human’s body or sore throat caused by the dry winter. This collection was produced during the Donghan dynasty and unearthed from the Guangling grave in Jiangsu province. Chinese characters, simplified or traditional?